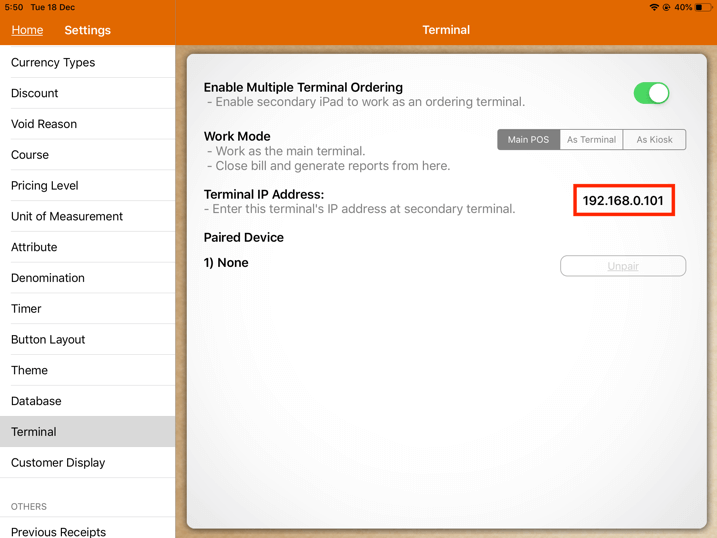 This guide explains about secondary iPad terminal set up and pairing. The image above is a sample of terminal setup. 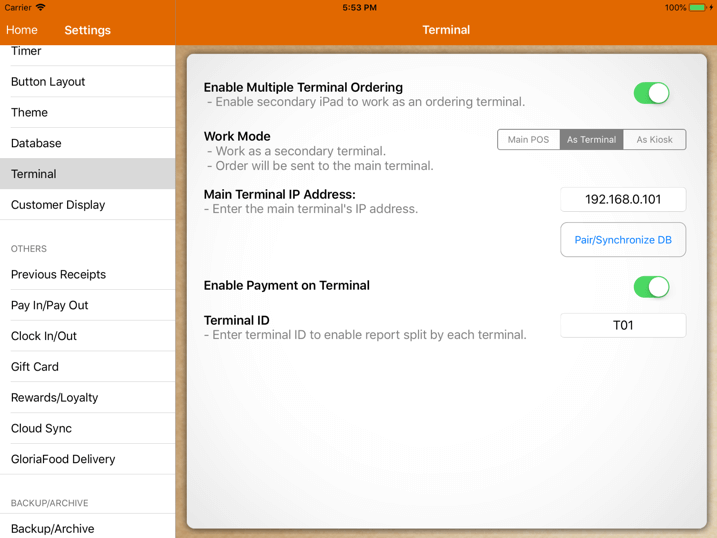 Generally we refer main POS as the iPad which acts as the server while the term terminal is used to refer to any secondary order sending device. User is required to have an additional iPad with MobiPOS downloaded. 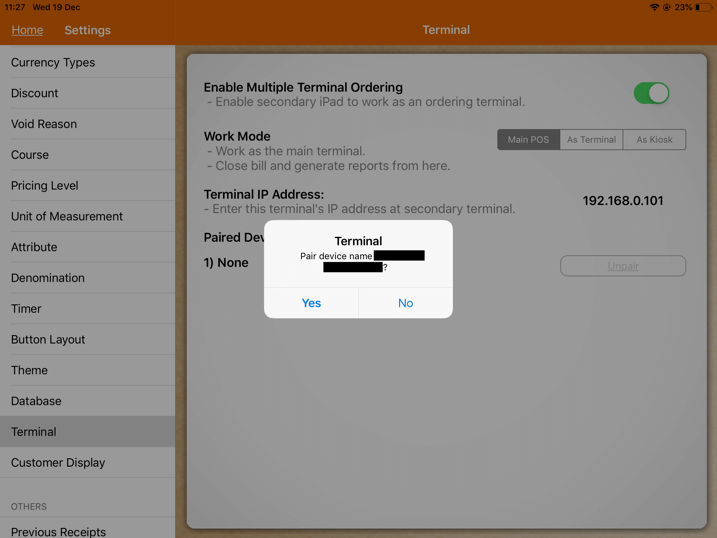 1) In the app, under Settings -> Terminal, turn on the switch of Enable Multiple Terminal Ordering on the right. 2) Beside Work Mode, select "As Terminal" instead. 3) Upon selecting the work mode as "As Terminal", insert the terminal IP address. To obtain the main terminal IP address, at the main POS, go to Settings -> Terminal. Main terminal IP address can be obtained beside the text field "Main Terminal IP Address". The main terminal IP address from the main terminal is shown as the image below. 4) Tap on "Pair/Synchronize DB". 5) For initial synchronization, the screen pops out an alert as shown below. In order to pair it, select "Yes". Pairing will be cancelled if "No" is selected. Upon selecting "Yes", there will be an alert in the main POS asking for approval to pair as shown below, select "Yes". Now at the secondary terminal, the synchronization starts. Do note that the terminal retrieves all information from the main POS and erase its own. If pairing is done in the wrong direction, you might lose all information. For example, trying to pair from a main POS which contains all your information with a device that contains only the demo information. By default, added terminal is not able to close bill. At the secondary terminal, turn on the switch beside "Enable Payment on Terminal" to allow the terminal to checkout bill. When payment is enabled in terminal, bill will printed at the main POS cashier printer by default. In order to have its own designated cashier printer, make sure the cashier printer is already in the printer list setup. Setting up or adding a new printer can only be through the main POS. Go to Settings -> Printers. Insert all the relevant information, then tap on "Save" at the top right corner as shown below. 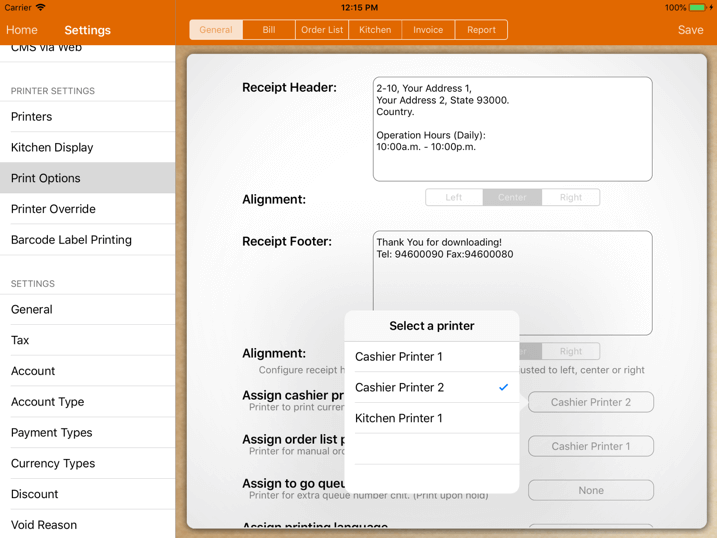 In this example we are using "Cashier Printer 2" as the terminal's printer. To know more about printer configuration, kindly refer to Printers for guideline. In order to get the updated printer list that has been setup at the main POS previously, user has to sync with the main POS again. 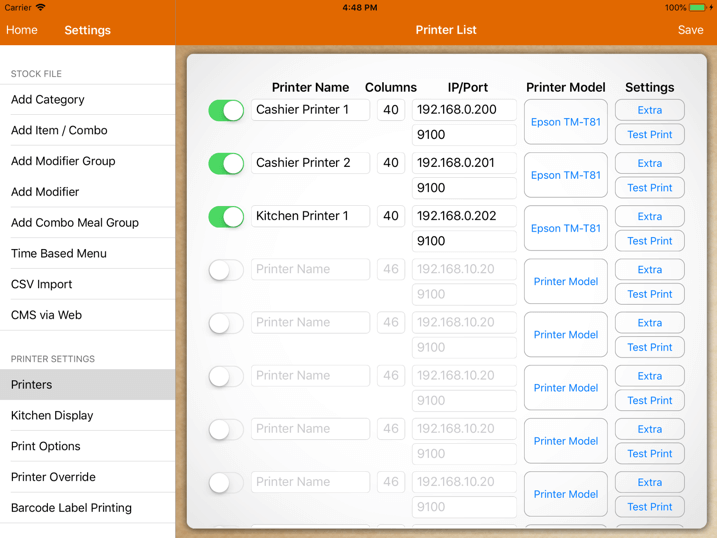 Upon synchronization, go to Settings -> Print Options. Then, tap on the button beside Assign cashier printer. Upon tapping, there will be a list of printers that have been set up at the main POS earlier. Next, from the list, tap the desired printer to be assigned to for this desired terminal. With this setup, when the main pos checkout, bill will be printed at "Cashier Printer 1" and the cash drawer will be popped out at that station. 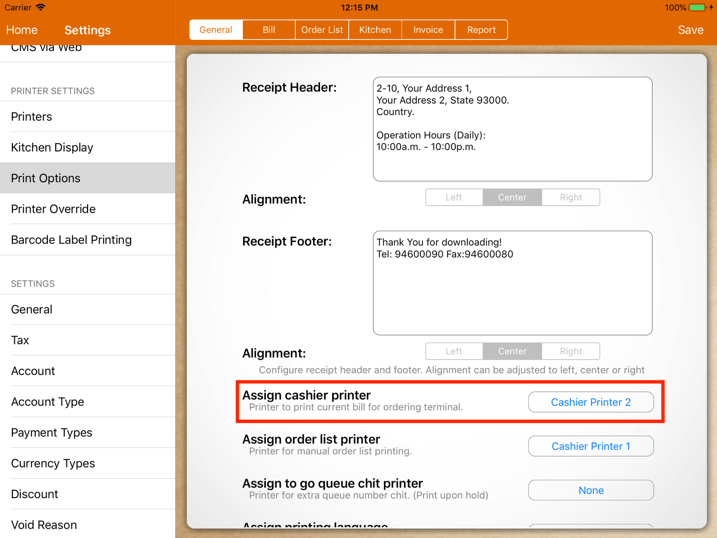 While in this iPad terminal, bill will be printed at "Cashier Printer 2" and the connected cash drawer will pop up accordingly. Terminal ID is used as identification of the device, user can insert any desired name. With this terminal ID, user will be able to have a separated sales report for the terminal. It can also be used to set up time based menu for each individual terminal. If user has enabled payment in the terminal but did not insert Terminal ID, all the sales report from the terminal will be combined with the main POS in a single report. To know more about time based menu, kindly refer to Time Based Menu for guideline. 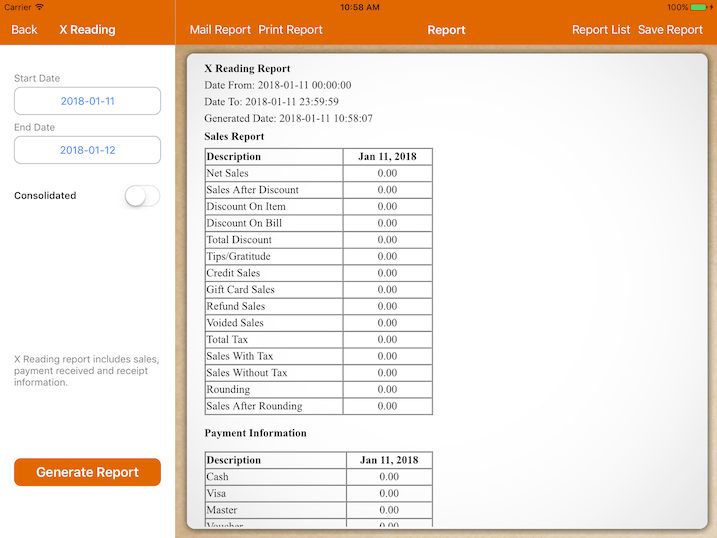 In order to obtain individual terminal report, go to Report -> Terminal Report. If there are sales coming from different terminals, there will be report for each terminals, provided that there is a terminal ID for each terminal. 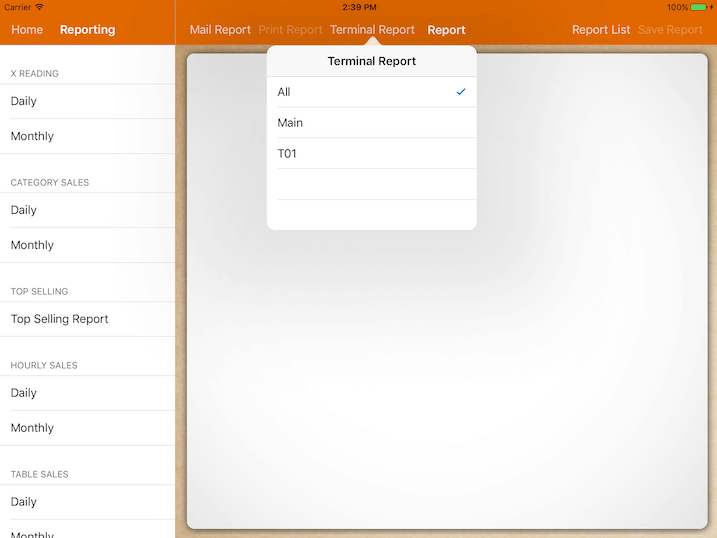 For example when there is only one secondary terminal, there will be 3 types of report. A consolidated report, a separate report for the main terminal and T01 (secondary terminal). If there is no secondary terminal, the terminal report selection button will not show up.